We are working on the schedule, getting the people we need under contract and working out the minor details of setting up our company. Yeah, I know not glamorous stuff but necessary evils to make sure we are all buttoned up. While we were doing the campaign and planning, we were all taking a risk hoping that we would reach our goal and get the chance to reboot a franchise that has been too long in hibernation, and thanks to all of you, we did it! Now the hard work on scheduling, tasking, hiring, and finding ways to work with others that want to help as well begins. Not to mention getting the necessary office stuff on site, paper, pens, markers, whiteboards, etc..etc..etc..lots to do, but we are up to the task. The idea is that we do all of that while we wait for Kickstarter to finish collecting the funds and transferring them over to us by the end of this month. Yep, we have not gotten them yet. Also, we are working hard on fulfillment, making sure we get everything that you guys pledged for sorted out, which is no small task - thanks for your patience as we work through all that data. Yep, we are all crammed into a small 1400 sq foot office, but we would not want it any other way. We will livestream from here, we will develop from here, and yep, at times we will sleep here - oh boy ! Tomorrow we will be livestreaming on our TwitchTV channel at 11am CST. Please enjoy the badge that will appear on your your DS website Avatar! Thanks and see you all in the verse! We celebrated the end of the Kickstarter campaign at Sholz Bier Garten hosted by local supporters. A great time was had by all! The project is transitioning from a Kickstarter campaign to game development. This means a deeper dive into the design. Be sure to keep an eye out for Rob's Design Updates. Check the Calendar for the next episode. It also means a deeper dive into the schedule. We've identified our "First Playable" milestone -- it is really more than a normal first playable. We'll release more on this in the near future. The Panzer concept is now under way and our goal is to have all ships concepts done by late April. In the meantime, we are also working on the KS rewards fulfillment. Our top team of technologists are pouring over the data and devising plans to incorporate all that goodness into our site. We'll get all that done as soon as possible. Along those lines, we have some changes in mind for the store. We'll let you know when they are ready to go live. Hey look at the top of the main page! The Shaman is getting closer to being unlocked. After that, the Torch-KS won't be too far behind! Last, but certainly not least, Kaji worked up some box art for us. Wingman has a box art poll on the forums. Head over there and have your say! Well, perhaps just reaching out to you, our stars. I'm responsible for pumping out the jams each week and sharing everything we're doing with you. Look for live streams, videos, blog posts, interviews, and the usual fun my mates have become known for. Thursday - Blog . Viewmaster's View . sharing experiences with the team, fans, lore, anything that seems fun and interesting. Also look for the What the FAQ!? forum thread where you can ask questions of the team. We'll pick the best questions to answer on the next week's Wingman's Hangout. I'll also be placing these on the DS calendar for easy reference. If you missed today's live stream, watch Wingman's Hangout on YouTube. 2nd - Survey - be sure to check out your Kickstarter Survey and fill it out if you can, any information will only help us get through the migration easier, and get better at working with you all. This week at Descendent Studios. We will be publishing our communication schedule, which will show when twitch streams will happen, when the Design Underground is available and when we are live streaming the Wingman's Hangouts. Be sure to sign up to our YouTube and TwitchTV channels to get first look at all the cool new videos. Also, we are going to introduce a gallery section on the website, which will have all the wallpapers and cool images for folks to take and use on their own sites, or to help you continue to spread the word - the more people that join, the more people to shoot! On that note, the referral program is still ongoing until the end of April, get your friends to sign up, pledge and you could win a hot new AMD 290X video card, the rules on how to enter and win are here on our forums. We want to say a HUGE THANK YOU to each and every one of our community members who backed, helped spread the word, offered ideas and feedback, and just MADE THIS HAPPEN! You are incredible, and we are humbled by your support, your passion, and your trust in us. Now the real work begins! We're diving directly into a fast, tight production cycle (after a much-needed weekend of rest), and really get busy making the game. Of course, you will all be along for the ride every step of the way. If you made it too late and didn't get a chance to back the Kickstarter, don't fear: we're moving the fundraising to our website, with all of the base packages, add-ons, and maybe some new stuff, too. We're also going to continue to push towards the stretch goals with the pledges raised on our store. That means you can still get your Torch KS! The free Torch KS applies to all game packages - including add-ons - when our total funding hits $650K! Thank you, thank you, thank you a thousand times! It's been an exhilarating month long campaign. So much discovered, so many new friends met, and the building of not just a great game, but an amazing community. Due to your amazing support our project has done very well, but we still have some work to do. Give a shout out to anyone you know and even those you don't that they have just a few more hours left join the rush and be part of something truly wonderful! Engadget had some very nice things to say about us. Lots of people have read the article and it shows. We've seen quite a bit traffic coming from their site in the last day or so. If you haven't read the article, check it out! There is still time to grab an add on from the Kickstarter page. This is a great way to support the project and get something cool too! And why not grab a super sweet wallpaper for your PC? Mike "Viewmaster" Morlan has put quite a few nice ones in the forum. Grab one or all of them. 650,000 and EVERYONE gets the Torch... come on you know you want it! Let's do this thing -- together! We have come a long way from here. New Trailer released and 30 hours to go! As we approach the last day of our campaign (30 hours to go), we are getting closer and closer to our goal. Today we updated our Kickstarter page, with an all new video. This shows the massive amount of progress our team has been making during the campaign and let's you guys get a good look at what is coming up. A big THANK YOU to everyone helping us spread the word, we are truly appreciative of all of your efforts, please keep it up, we are confident with the last day spike we can get there, but in order for that to happen we need to keep sharing with friends and even enemies if necessary to get this over the hump. There is a contest going on for some AMD 290 video cards, check our forums for the rules in how you can get your hands on one by referring folks to become backers. We also released a new tier called "Strength in Numbers" you get 4 copies of the game, and Alpha and Beta access, this is a great way to get a few extra copies you can gift to friends. We need more people to shoot us and be shot by us - so check that out on our Kickstarter page. We will have some pretty cool stuff to show over the next few days, here is a small teaser for you guys to look forward to. Also, we are going to be live streaming quite a bit over the next two days on our Twitch channel. Tomorrow at 10am CST and Friday at the same time we have an all day stream going. We have some fun stuff to show, and to do, with all of you as we surge towards that magical finish line of $600,000 on our Kickstarter campaign. We also added a new tier today - for $100 you can pick up 4 copies of the game and they come with both Alpha and Beta access. These can all be gifted to a friend after the campaign ends. Today we launched our refer a friend contest, where the top people who bring in new backers will win an AMD 295X Video card. Get the details on our forums. Only 3 days left in the Kickstarter campaign, and we're already starting to see the end-of-campaign spike that we need to reach our goal. We rocketed past $400K today, and we're drawing ever closer to 6000 backers. With your continued help, we can make this game a reality. We can do this! 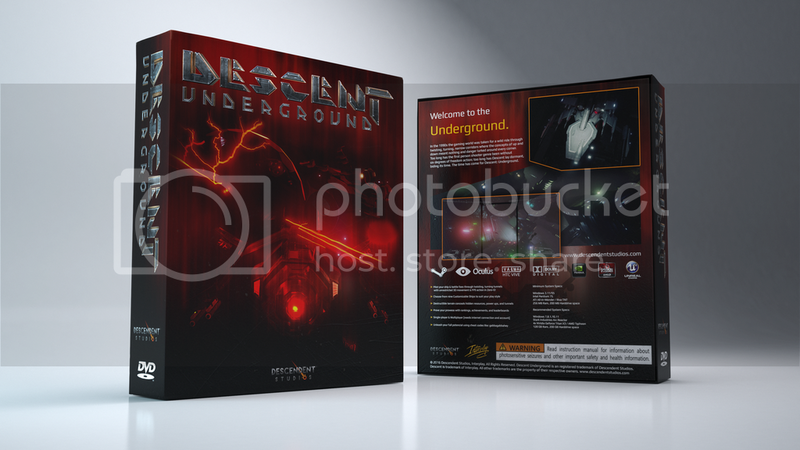 Descent: Underground has appeared in over 80 different publications, and the word is good! A lot of this traffic is thanks to you, the community, reaching out to spread the word. If you're interested in what people are saying about us, take a look at our press page. With the way things are going, we're also wondering how y'all feel about stretch goals: should we start showing them now, or wait until we're at (or near) the goal? What better way to find out the community's opinion than to ask? Be sure to stop by the forums and cast your vote in the stretch goals poll.